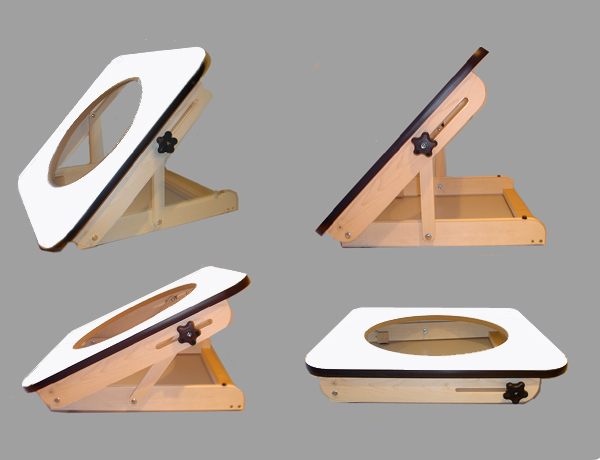 *Easel Design Pro Animation Lightbox without Disc, with duel color corrected (pure white light) bulbs for 30w florscent light which is equal to 150watts of incondescent light. 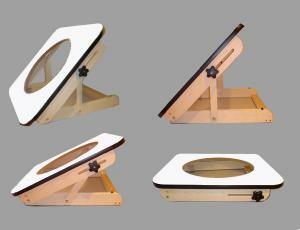 Footprint is 23" x 24"x 4"
The New top is made of white MDF with black banding the same as our pro station with lid support and base of wood. The 3/4" MDF top will not warp and is more durable and easier to clean. The hole is 16 3/8" and will support any pro disc on the market. The slotted wood lid support will allow the top to be raised and lowered without fear of it falling or slipping out of the cavity carved on the base. Works extremely well with the Any Pro 16f Disc. Beautiful fit....looks grat and works very smooth. Does not work well with the 12f ChromaColour Disc because of the backing block of metal on the 12f Disc. It is too deep for the light in the Easel Design Pro unless you remove the square metal box on the back of the 12f disc. Or put a 3/4" spacer on the back of the Easel Pro to move the light source further out from the top so the 12f ChromaColour Disc can clear.